Every home cook should always have a fine knife set at home. Knives are only one of the most important kitchen utensils in the culinary world, you simply can’t create flawless meals without them. One brand that comes to mind when it comes to cutlery is Faberware. Faberware sports a fine selection of knives that can help any home cook create perfectly cooked dishes without having to shell out a lot of cash. What Should You Consider When Choosing A Knife? Faberware is one of the most known brands in the America and one of the highest selling brands of cutlery in the market today. What’s great about Faberware knives is that they are really affordable and reliable. Unlike more expensive brands that can cost you more than 20 bucks a piece, Faberware knives only go for half the price. It’s interesting enough that Faberware knives are highly affordable, but that doesn’t mean that these knives lack in performance. 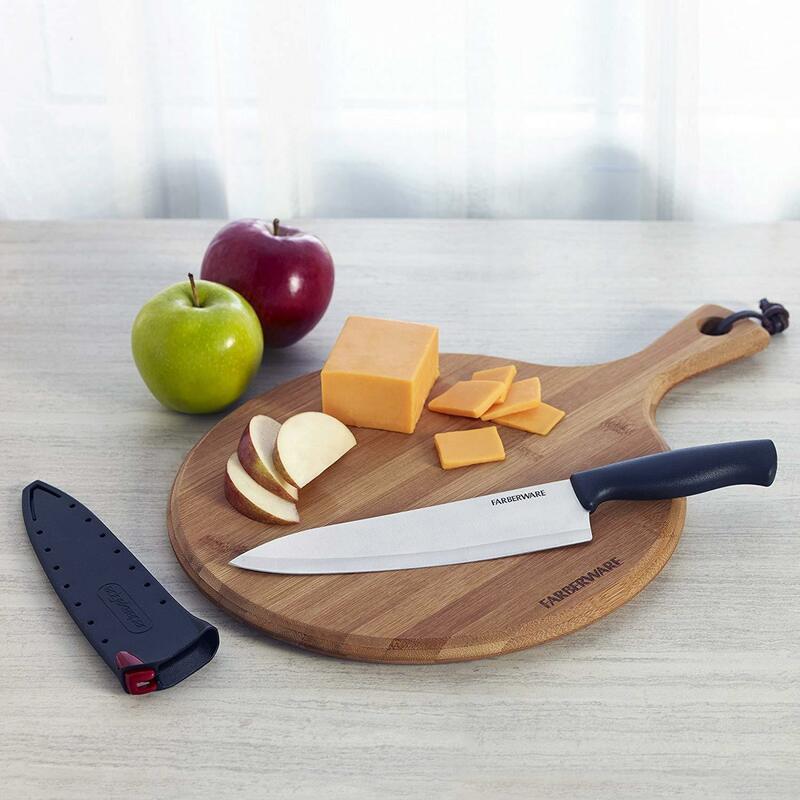 Faberware knives are just as sharp-edges as more expensive types, and can help you seamlessly cut any kind of food. 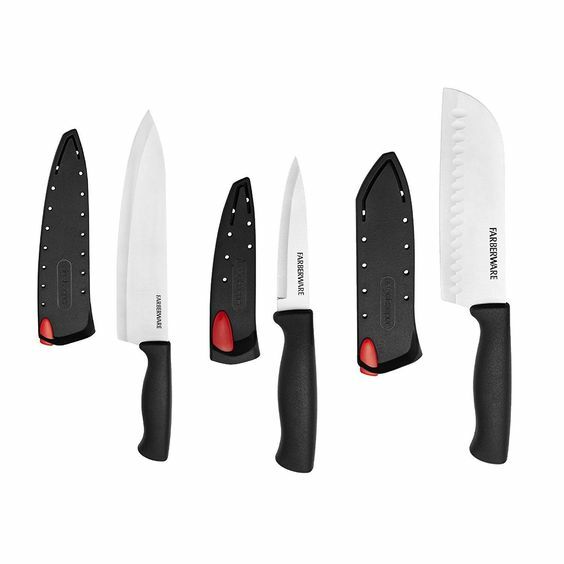 Needless to say, Faberware knives are the ultimate choice for any home cook who’s looking for an entry level knife. Whatever product you wish to buy, it’s always important to go through a set of standards that can help you make sure that the product you are planning to get will meet your personal requirements. Before buying a piece of cutlery, I suggest you take a look at these following factors that you should consider beforehand so that at the end of the day, you will be a happy and satisfied customer. Knives can come with different types of blades. The three most common types of blades you will find on a knife are plain, serrated, and micro-serrated. You may have noticed that there is actually more than one kind of knife. There are actually more than 15 types of knives in the market today, and each one has its own specific purpose. Some knives were created for slicing and cutting, others are for carving, while some are for de-boning or peeling. Try to choose a knife that you think will work best for the type of ingredient and function you need. 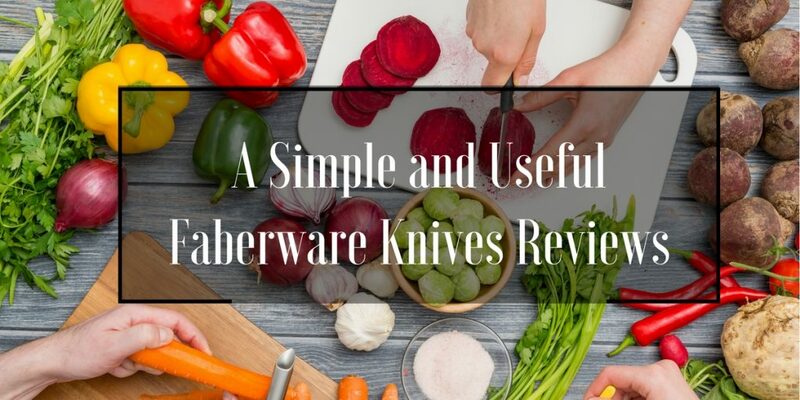 If you don’t know what kind of function you will need, you can always rest easy knowing that there are also all-around chef’s knives that can be used for all sorts of culinary tasks. When it comes to a knife’s design, I’m not referring to how it looks. Though a finely-designed knife can be a great eye-catcher, the design I’m talking about refers to ergonomics. Knives are obviously hazardous tools, this is why you should always opt for a knife that comes with a comfortable handle that you can easily grip. Before you choose a knife, try to figure out if its handle can provide you with the perfect balance. Doing so can help reduce any cutting accidents in the future. Some knives in the market today come with different kinds of accessories. Though I personally think accessories aren’t really a deciding factor, it’s still nice to know that the product you are getting comes with a couple of free stuff whether it be a seathe, a sharpener, or a handy cutting board. The last thing I consider when it comes to choosing knives is the ease of cleaning. Unless you’re the type of person who loves cleaning, you should try to choose a knife that can be dishwashed. 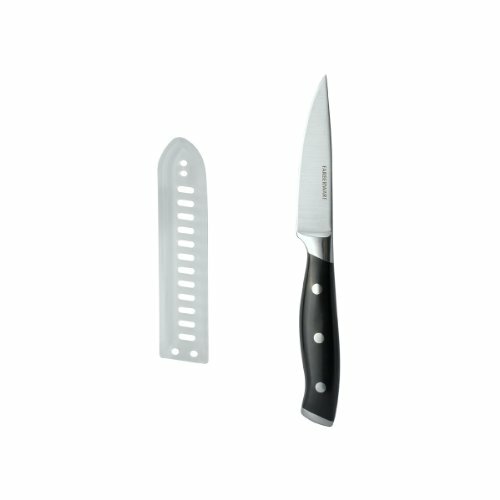 This Faberware chef’s knife is the ideal kitchen tool for all around use. This type of knife comes in different sizes from small 4-inch ones to lengthy 8-inch ones. 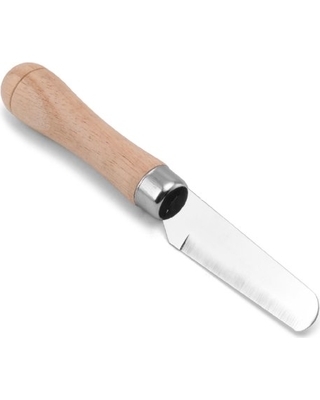 If you decide to get this knife, you don’t have to worry about how long it can last you in the kitchen. It comes with a blade forged with high-carbon steel that will surely last you years. 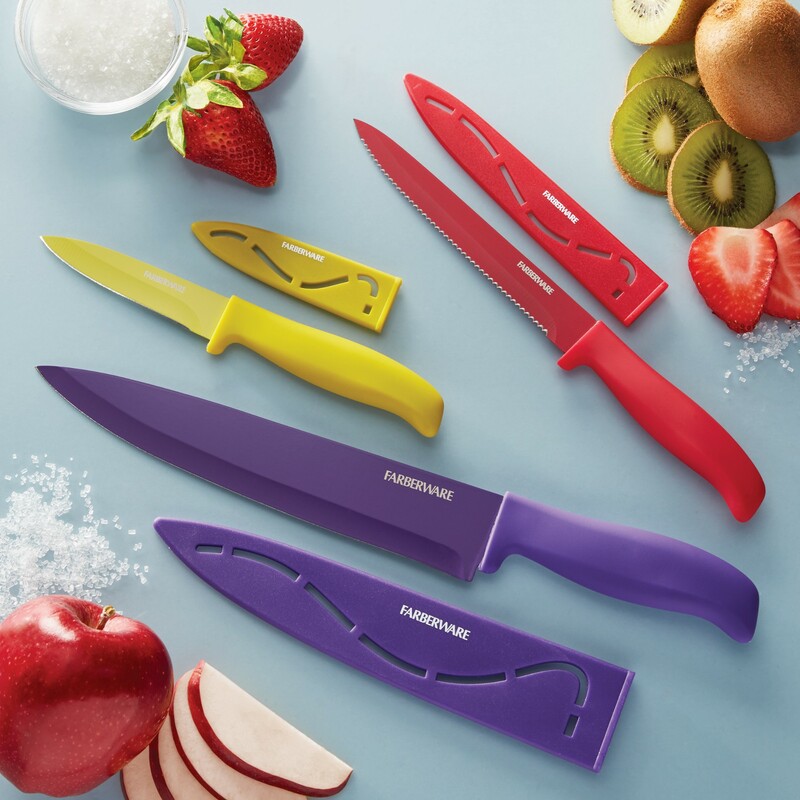 This 6-piece Faberware knife set is a great tool for cutting dense pieces of meat and cheese, chopping veggies, and even peeling fruits because it comes with an 8-inch chef’s knife, a 3.5-inch paring knife, and a 5.5-inch serrated utility knife. 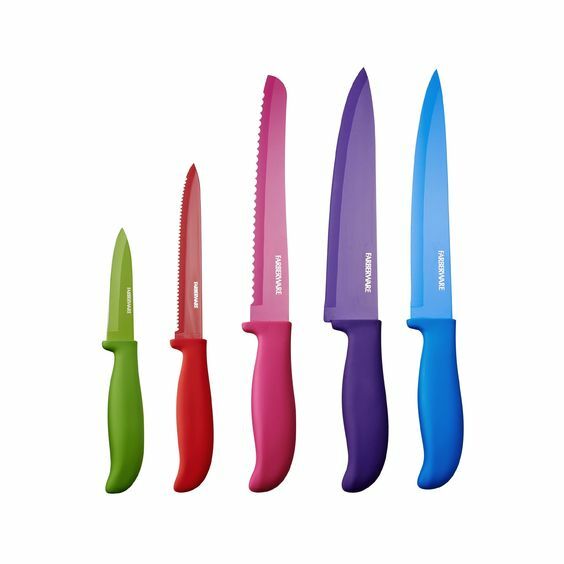 What makes this knife set great is that all of the knives within it comes with a non-stick coating for seamless cutting and slicing. That’s right, say goodbye to that irritating piece of food that’s keeping you from performing continuous cuts and slices. 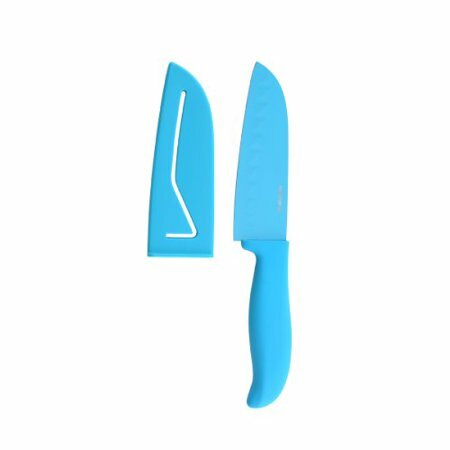 ​Each knife in this set comes with its own sheath , and is made with perfectly balanced handles for comfortable maneuvering as you cook. It’s also dishwasher safe and very easy to maintain. 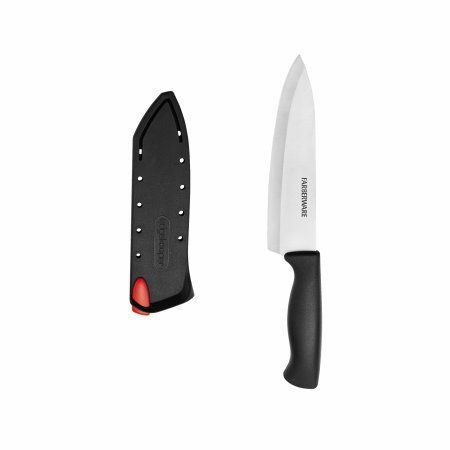 This Santoku knife is a great piece of cutlery that you can use to effortlessly cut pieces of meat, vegetables, and fruits. What I like about this knife is that it comes with a nice non-stick interior that completely eliminates slow cutting due to ingredients sticking to one side of the blade. It also comes with a nice sheath that completely covers the blade. This Faberware paring knife can help you peel all kinds of fruits and vegetables, especially those tough-skinned tomatoes. Just like other Faberware knives in this list, this one also comes with its own sheath . However, unlike other sheath s that usually come with Faberware knives, this one comes with a clear sheath that I personally think looks a lot better than fully covered ones. The Farberware 6-Piece Stick-Resistant Cutlery Set is surely a great choice for any home cook since it offers three different types of knives including a chef’s knife, a utility knife, and a paring knife. What makes this cutlery set the best choice out of all the products I have mentioned above is the versatility that it offers when it comes to cooking and preparing ingredients. It comes with a very handy non-stick coating that can help you move faster in the kitchen and it even comes with a bunch of sheath s for easier maintenance.